This article is about Husqvarna Motorcycles GmbH. For other uses, see Husqvarna. Husqvarna Motorcycles GmbH (Swedish: [²hʉːsˌkvɑːɲa] ( listen); marketed as Husqvarna) designs, engineers, manufactures and distributes motocross, enduro, supermoto and street motorcycles. The company began producing motorcycles in 1903 at Huskvarna, Sweden, as a subsidiary of the Husqvarna armament firm. Today, Husqvarna Motorcycles GmbH is owned by Austrian KTM AG. Husqvarna was founded near the town of Huskvarna in Sweden in 1689. The company started out as a maker of muskets, and the Husqvarna logo still depicts a gun sight viewed from the end of the barrel. As with many motorcycle manufacturers, Husqvarna first began producing bicycles in the late 19th century. In 1903, they made the jump to motorcycle manufacturing. The first "Husky" motorcycles used imported engines, and it was not until 1918 that Husqvarna began producing machines built entirely in-house. Around that time they secured a contract with the Swedish Army and began entering cross-country and long-distance motorcycle races. In 1920, Husqvarna established its own engine factory and the first engine to be designed was a 550 cc four-stroke 50-degree side-valve V-twin engine, similar to those made by companies like Harley-Davidson and Indian. Husqvarna competed in Grand Prix road racing in the 350cc and 500cc classes during the 1930s and was Sweden's largest motorcycle manufacturer by 1939. All of the racing bikes were based on a 50-degree V-twin prototype built by Folke Mannerstedt in 1931. The company team beat the Norton works team at the Swedish GP in 1931 with a 1–2 finish by Ragnar Sundqvist and Gunnar Kalen. This and the next year's success led to a full commitment to the GP tracks with Stanley Woods and Ernie Nott joining the Husqvarna riding team. That year, Nott finished third in the 350cc Junior TT and Woods ran out of gas eight miles before the finish of the Senior TT. In 1935 the company withdrew racing support, but new bikes were still produced and raced privately, while the company focused on producing a new two-stroke, two-speed commuter bike. That year, Woods won the Swedish GP (marking the fourth year in a row that a "Husky" had won) on a 500cc Husqvarna motorcycle that weighted 279 pounds (127 kilograms). In the 1960s, their lightweight, two-stroke-engined off-road bikes helped make the once-dominant British four-stroke motorcycles obsolete. Throughout the 1960s and 1970s, Husqvarna was a dominant force in the motocross world, winning 14 motocross world championships in the 125 cc, 250 cc and 500 cc divisions, 24 enduro world championships and 11 Baja 1000 victories. Toward the end of World War II, a team comprising Bengt Magnusson (head of R&D), Stig Tham (engineer), Calle Heimdal (engine designer) and Birger Johansson investigated manufacture of a small, simple, inexpensive car. The design looked similar to the Saab 92, but with three wheels (two front, one back), and an unusual split rear window. According to some sources, the similarities with the Saab 92 may have had something to do with Sixten Sason working as designer at Husqvarna. A prototype was built in 1943, powered by a 20 hp (15 kW) two-cylinder 500 cc DKW motorcycle engine with chain drive to the rear wheel. The wheels came from a Fiat 500. The project was cancelled in 1944, and the prototype was scrapped at the end of the 1950s. Husqvarna is also prominent in Swedish bicycle history. They have been one of the Swedish military bicycle manufacturers. Husqvarna's Novo hub competed well with imports, but bicycle manufacturing was discontinued in the early 1960s. In 1987, the Husqvarna motorcycle division (not the other arms of the brand such as chainsaw production) was sold to Italian motorcycle manufacturer Cagiva and became part of MV Agusta Motor S.p.A. A group of the company's managers and engineers were not willing to move to Italy and therefore founded Husaberg AB – which was acquired by KTM AG in 1995. Husqvarna motorcycles were then produced in Varese, Italy. In July 2007, Husqvarna motorcycles was purchased by BMW for a reported €93.000.000. BMW Motorrad planned to continue operating Husqvarna Motorcycles as a separate enterprise. All development, sales and production activities, as well as the workforce, remained at the Varese location. BMW intended to position Husqvarna as "the two-wheeled version of what Mini is to the BMW's car division". On 31 January 2013 BMW Group announced that Pierer Industrie AG has bought full stake in Husqvarna AG for an undisclosed amount. Pierer Industrie AG CEO Stefan Pierer was also the CEO of Cross Industries AG, then the main shareholder of KTM-Sportmotorcycle AG parent KTM AG, and the CEO of KTM AG. Later in 2013, direct ownership of the Husqvarna company was transferred and license rights were sold from Pierer Industrie AG to KTM AG, making the newly established Husqvarna Motorcycle GmbH part of the KTM Group. Husqvarna motorcycle production at Mattighofen in Austria started on 7 October 2013. At the same time, Husqvarna-spin-off Husaberg was re-united with Husqvarna, terminating the existence of the Husaberg brand. Husqvarna Motorcycles produces a diverse range of motocross, enduro and supermoto machines using their own two-stroke or four-stroke engines, ranging in capacity from 125 cc to 693 cc. Racing continues to be important to Husqvarna, with factory teams participating regularly in World Enduro, Motocross, Supercross and Supermoto championships. Recently, Husqvarna Motorcycles has been preparing its re-entry into the street motorcycle market. In 2014, the company presented prototypes of the newly developed 401 VITPILEN and 401 SVARTPILEN at the EICMA in Milan, Italy. Production ready versions were shown in 2016. Together with the 701 VITPILEN, which was first revealed in 2015, these motorcycles became publicly available in 2018. Husqvarna has been a regular and successful presence at international off-road racing events since the 1930s. By 2008, riders on Husqvarna machines had secured more than 70 Motocross, Enduro and Supermoto world titles as well as numerous victories at important rally races like the Baja 1000. Since 2015, the energy drink manufacturer Rockstar is the title sponsor of Husqvarna's off-road factory team. The Rockstar Energy Husqvarna Factory Racing Team competes in all off-road classes, participating in every event of the AMA Supercross and Motocross series. So far, it has scored titles in the 2016 FIM Cross-Country Rallies World Championship, the 2015/2016 FIM SuperEnduro World Championship and in the 2016 AMA EnduroCross Championship. 1959 – Rolf Tibblin, European Motocross Champion, 250 cc class. 1960 – Bill Nilsson, Motocross World Champion, 500 cc class. 1962 – Rolf Tibblin, Motocross World Champion, 500 cc class. 1962 – Torsten Hallman, Motocross World Champion, 250 cc class. 1963 – Rolf Tibblin, Motocross World Champion, 500 cc class. 1963 – Torsten Hallman, Motocross World Champion, 250 cc class. 1966 – Torsten Hallman, Motocross World Champion, 250 cc class. 1967 – Torsten Hallman, Motocross World Champion, 250 cc class. 1969 – Bengt Åberg, Motocross World Champion, 500 cc class. 1970 – Bengt Åberg, Motocross World Champion, 500 cc class. 1974 – Heikki Mikkola, Motocross World Champion, 500 cc class. 1976 – Heikki Mikkola, Motocross World Champion, 250 cc class. 1979 – Håkan Carlqvist, Motocross World Champion, 250 cc class. 1993 – Jacky Martens, Motocross World Champion, 500 cc class. 2014 – Tony Saunders, UK GT Cup, Youth Lites Class. 2014 – Nathan Watson, UK Mx National, MX1 Class. 2017 – Zach Osborne, Lucas Oil AMA Pro Motocross Championship, 250 cc class. 2017 – Zach Osborne, Monster Energy AMA Supercross Championship, East Coast 250 cc class. 2018 – Jason Anderson, Monster Energy AMA Supercross Championship, 450 cc class. 2018 – Zach Osborne, Monster Energy AMA Supercross Championship, East Coast 250 cc class. ^ a b c Walker, Mick. Motorcycle: Evolution, Design, Passion. The Johns Hopkins University Press, Valtimore. p. 56. ISBN 978-0-8018-8530-3. ^ "The Husqvarna Story: Four centuries of innovation". husqvarna.com. Retrieved 2017-09-05. ^ Cathcart, Alan (May–June 2012). Historic Racer: Riding Sammy Miller's 1934 Husqvarna 500 GP Racer. Motorcycle Classics. pp. 46–51. ^ Cathcart, Alan. Historic Racer: Riding Sammy Miller's 1934 Husqvarna 500 GP Racer. Motorcycle Classics. 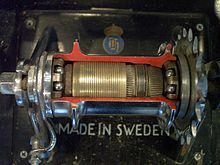 ^ "Swedish bicycle history". Archived from the original on 2011-06-10. Retrieved 2011-06-05. ^ Stenqvist, Ake. "A small history of Bicycles in SWEDEN". Benvanhelden.nl. Retrieved 2011-06-05. ^ "#inthisyear1995: KTM acquires Husaberg". blog.ktm.com. Retrieved 2017-09-05. ^ "Updated: BMW Buys Husqvarna From MV Agusta". roadracingworld.com. Retrieved 2017-09-05. ^ "BMW Sells Husqvarna Motorcycles to Pierer Industrie AG". bmwmcmag.com. Retrieved 2017-09-05. ^ "Pierer Industrie AG Management". piererindustrie.at. Retrieved 2017-09-05. ^ a b KTM AG. "Annual Report 2013" (PDF). ktmgroup.com. Retrieved 2017-09-05. ^ Husqvarna Motorcycles. "The Company". press.husqvarna-motorcycles.com. Retrieved 2017-09-05. ^ "First units in Austrian-based 2014 Husqvarna production line complete". motoonline.com.au. Retrieved 2017-09-05. ^ "Husqvarna and Husaberg Reunited". 2013-09-27. Archived from the original on 2014-02-22. Retrieved 2014-02-12. ^ "701 Supermoto 2017". husqvarna-motocycles.com. Retrieved 2017-09-05. ^ "Milan Show: Husqvarna wows with two concept bikes". motorcyclenews.com. Retrieved 2017-09-05. ^ "Husqvarna introduces 2017 line of Vitpilens in Milan". motocrossactionmag.com. Retrieved 2017-09-05. ^ "Milan Show: Husqvarna show 701 Vitpilen concept roadster". motorcyclenews.com. Retrieved 2017-09-05. ^ "The New Husqvarna Motorcycle Vitpilen Series". Ikon London Magazine. 12 December 2017. Retrieved 23 February 2018. ^ "Husqvarna Motorcycles' all-new 2018 enduro range unveiled". husqvarna-motorcycles.com. Retrieved 2017-09-05. ^ "Supermoto". Husqvarna Motorcycles. Retrieved 6 January 2019. ^ "VITPILEN 401 - 2019". Husqvarna Motorcycles. Retrieved 6 January 2019. ^ "SVARTPILEN 401 - 2019". Husqvarna Motorcycles. Retrieved 6 January 2019. ^ "Vitpilen 701 - 2019". Husqvarna Motorcycles. Retrieved 6 January 2019. ^ "Vitpilen 701 - 2019". Husqvarna Motorcycles. Retrieved 6 February 2019. ^ von Kuenheim, Hendrik. "The Future of BMW Motorrad - Hendrik von Kuenheim talks to the media in Munich, April 16, 2008". Cycleworld.com. Retrieved 2017-09-05. ^ "Rockstar Energy Husqvarna Factory Team Announced". Innovationoffroad.com. Retrieved 2017-09-05. ^ "Rockstar Energy Racing". Rockstarenergyracing.com. Retrieved 2017-09-05.